A key goal in providing applications decision support is facilitating Situational Awareness. Situational awareness in a disaster scenario, such as a hurricane, chemical spill, or severe storm is something that is continually developed and arrived at by loosely coordinated field workers each given a large degree of autonomy within their own roles. Each emergency manager has a set of local knowledge based on their perception of the situation at hand and on the a priori knowledge of an environment. The Big Board is one tool aimed at easing the transition from situational awareness into situational understanding. Situational understanding goes beyond awareness and facilitates decision making and collaboration via the transfer of knowledge (as opposed to information or data) between fielded workers. Teleconferencing is a medium that is well suited to providing situational awareness. However in the case of wide-area decision support, traditional teleconferencing systems fall behind in providing what emergency managers want: a shared workspace analogous to the real-world. As a tool for this, we developed a prototype system for “teleconferencing over maps.” Teleconferencing over maps provides a shared map, tools for drawing on that map, and collects real-time overlays that are relevant to the decisions at hand. These overlays can come from any source on the web conforming to a number of popular standards, and can also include sensors that the individual managers carry on them. Overlays can be grouped and customized by role so that users aren’t presented with information overload when trying to manage a rapidly developing situation. 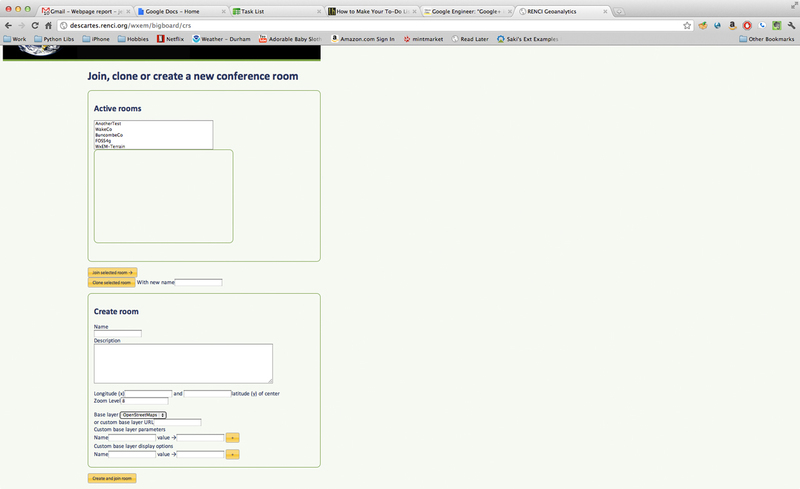 To begin, a user creates a conference room. Conference rooms consist of a base map and an initial view. Base maps can include Bing, Google, Yahoo, OpenStreetMap, or any OGC WMS service in a standard projection. The room then shows up on the directory where users can log in and access it. As users join the room, they can navigate independently of each other, working on their own until a common view is needed. When a common view is needed, they can share their overlays, pushing the overlays to all users in the conference and then center and re-zoom on that user’s current focal point, giving everyone a common view to proceed from. The Big Board is a proof of concept prototype. It has been adapted as such to the domains of natural disaster management and to epidemiological decision support. If you believe the Big Board may be useful to you, contact Jefferson Heard by email at jeff at renci dot org to discuss your idea. RENCI is open to collaborative projects with university and industry scientists and is an institute of the University of North Carolina at Chapel Hill.